Strawberry Pineapple Fruit Popsicles are the perfect simple naturally sweetened frozen treat for hot summer days! This is an ideal summer treat for everyone! Another great healthy treat is this Homemade Honeydew Melon Sorbet recipe! This recipe was originally posted July 27, 2016, we’ve tweaked it a bit since then. This post may contain affiliate links. Read my disclosure policy here. These 5 ingredient strawberry pineapple fruit Popsicles are so refreshing on a hot summer day. The best part is there is no added sugar! Just sweetened with fruit and honey makes them amazing. My little girl loves frozen treats and this one has quickly become a favorite of her’s. 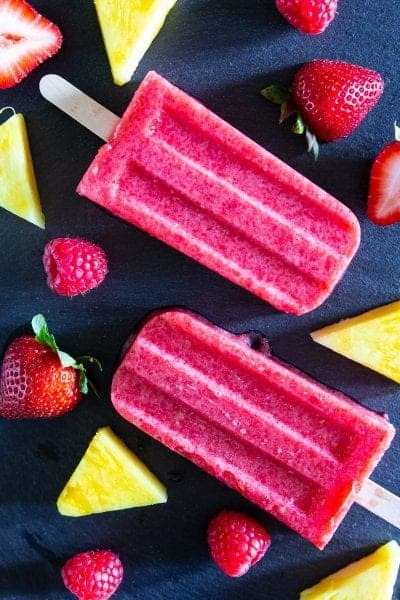 Anyone who loves Popsicles will definitely enjoy these fruit pops, and will ask for them over and over again on hot days! Begin by printing the recipe below and reading to learn measurements. Combine fruit and other ingredients to blend and then pour into preferred popsicle molds. Leave in molds until ready to serve. To remove from the molds, you may want to run under warm water to help loosen. What fruits make good fruit popsicles? Since these are so simple to throw together and freeze, I wanted to share some other great combinations with you. Mix and match your favorite fruit flavors to create new fruit popsicle flavors. Follow the same measurements using different flavors for the best results. Summertime brings about some of my favorite fruit flavored dessert recipes. I love having something light and fresh on hand for parties and weekend barbecues. Having a simple recipe is a must, and especially handy when you don’t feel like being in a hot kitchen all day long. Below are some more great ideas that are favorites during the hot days of summer! Strawberry Pineapple Fruit Popsicles are the perfect simple naturally sweetened frozen treat for hot summer days! 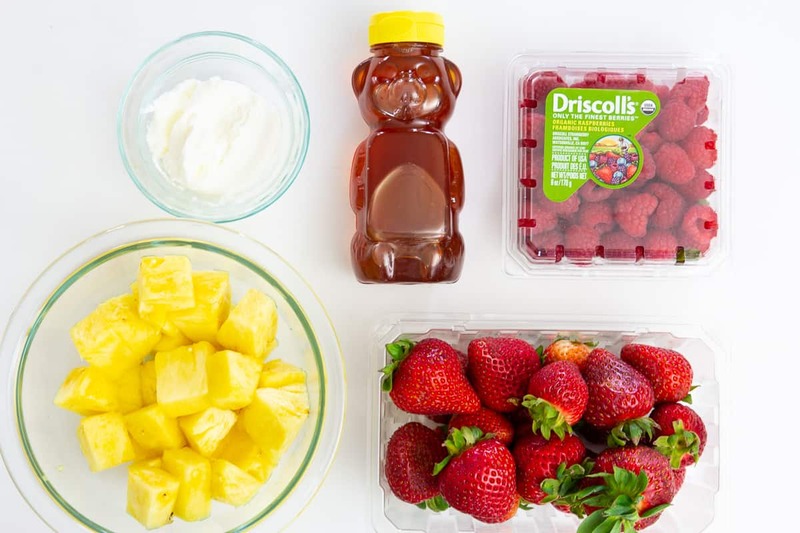 Place the pineapple, strawberries, and raspberries in a food processor. Blend until smooth. Add the honey and Greek yogurt. Blend once more to combine. 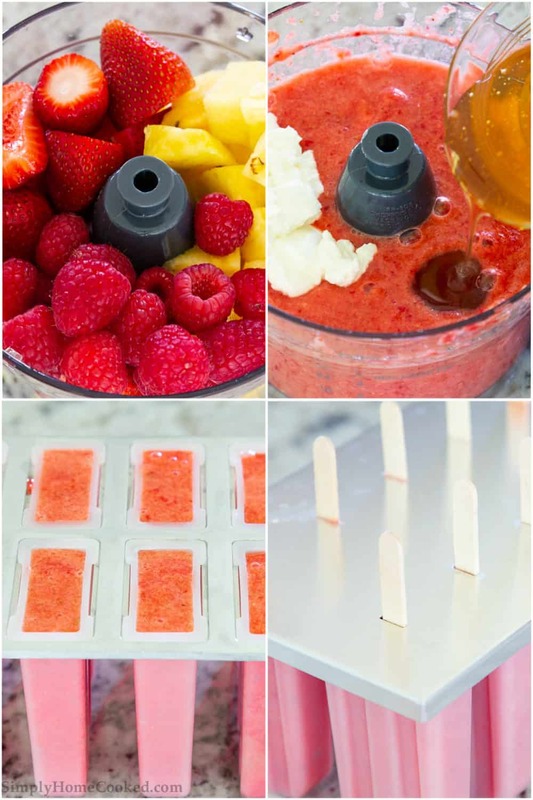 Pour the blended fruit into Popsicle molds, add the Popsicle sticks and freeze overnight. When removing the Popsicles from the molds give them a few minutes to thaw around the edges so they come out easier. Do you remember who the mfg is of the molds you bought from amazon? Hi Nancy, I’m not too sure what you mean by “the mfg”. Can you clarify that please. Thank you. Could you substitute almond milk for yougurt? Hi, I’ve never tried substituting yogurt for almond milk so I’m not too sure how it will turn out. It will definitely change the consistency though. I don’t care for raspberries is there a sub or can I leave out? Hi Connie, you can substitute the raspberries for extra strawberries instead. I’m so making these for the kids! Where did you get those Popsicle molds?